Treat yourself to the pampering and pleasure of a mobile massage service without having to leave the convenience and comfort of your home, office or hotel suite—with our comprehensive and professional mobile massage therapy services. We specialize in out-call and in-home mobile therapy for residents and guests in and around the Scottsdale and Phoenix Arizona, Las Vegas Nevada, and the Southern California areas. All you have to do is call us, and we will send our highly trained, vetted, professional and courteous therapists to your door in as little as two hours time, 7 days a week. We provide the equipment, ambiance and of course the magic touch…thereby providing you with personalized and luxurious resort-level spa treatment and therapy services. Then you just have to relax and allow us to work our magic, while you bask in the luxurious glow of pampered, pleasured bliss. Each of our 40 licensed, insured and experienced therapists is trained in the following modalities: Swedish, deep tissue, sports, couples, reflexology, trigger point, pregnancy, therapeutic, chair, and special event. Please Inquire now, If you are desiring a personalized, professional and proficient pampering session to relieve stress, rehabilitate muscles, tendons, ligaments, and joints, increase feelings of mental, physical and emotional wellbeing, not to mention a one-of-a-kind relaxation experience, then look no further. No matter the technique, modality or location, our magic hands have you covered from head to toe—and everywhere in between. We offer professional in-home and outcall therapy sessions for durations of 30, 60, 90 and 120-minute massages with a 1-hour minimum... Add-on services to complement therapy sessions are available, thus giving you the ability and opportunity to schedule several different treatments at the same time. There is no easier or more convenient and comfortable way to turn your day into a personalized spa session than by picking and choosing all of the services your heart desires. There is no need for you to fret over travel time, endure the countless traffic-induced headaches, or experience any other stressor associated with navigating your way to and from a storefront or salon. Rather, allow us to come to you, serve your therapy needs, and then leave you in a state of total peace, bliss, relaxation, and rehabilitation from head to toe. Please feel free to contact us, in order to discuss the best mobile massage therapy option, as well as any accompanying add-on treatments that will meet your needs and exceed your expectations. Imagine the pampering pleasure, and the experience of a lifetime for you and your spouse or partner, all without having to leave the comfort and privacy of your own home or hotel suite. Well, you needn’t merely imagine this anymore, thanks to our professional and experienced therapists. 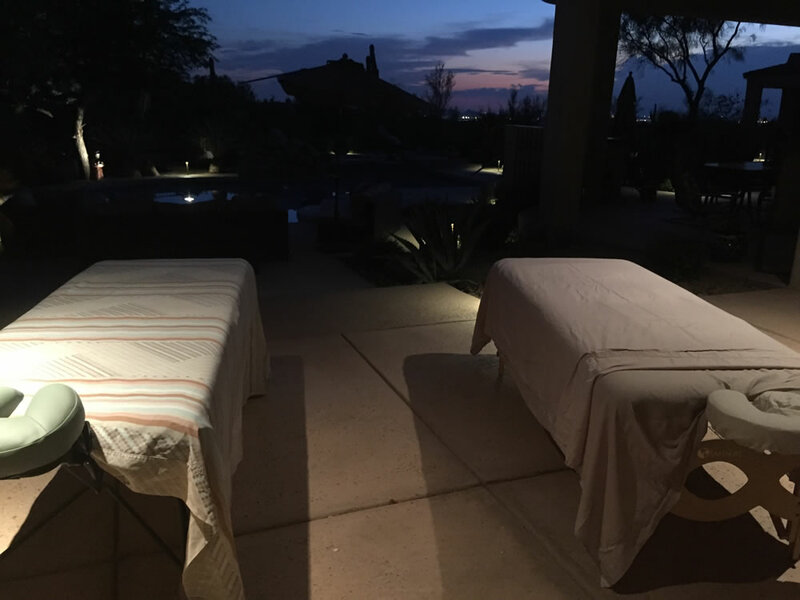 We will schedule you two of our licensed, insured, a beautiful couples massage at sunset highly trained and experienced massage therapists for a superior yet intimate treat for you and your loved one alike and at the same time. This is a special gift that can be used to celebrate birthdays, anniversaries, or any other romantic occasion for residents or guests in and around the Scottsdale and Phoenix Arizona, Las Vegas, and Southern California areas. In addition, choose several accentuating treatment add-ons—including a sea salt body scrub, or even a gourmet and customized 4-course meal prepared by our own expert personal chef, and served by candlelight. With A Magic Touch, you can create a unique, personalized and individualized romantic experience that both you and your loved one will cherish always, and more importantly never forget.